Simon Says Stamp – I Love You card! Today I have a watercolour card using Roses for You Stamp set and I love you die from You have my Heart collection from Simon Says Stamp. I really love Roses for You stamp set for its whimsical doodle images. I stamped the whimsical heart shape on watercolour paper using versamark and white heat embossed them. I stamped three or four images at a time and heat emboss. I then can see where to stamp the next few to get the random look. Versamark on white is hard to see. Once the entire panel is stamped, I watercoloured the hearts using various shades of red and pink Zig Clean Brush watercolour pens. I used the grey pens to add shading and depth to the heart shapes. Once dry, I die cut this panel using the largest of the stitched rectangle die from Simon Says Stamp Stitched Rectangle die set. Love the stitched detail on the panel. This has pretty much become my staple for all my cards lol! For the focal point, I black heat embossed the flower and leaves heart image from Roses for You stamp set on watercolour paper and coloured the image using Zig Clean Brush watercolour pens. Once dry, I die cut the image using the coordinating dies. I also die cut I Love You from watercolour paper. I wanted to do ombre shading on it initially but then I ditched the idea. So now it is time to assemble the card. I adhered the watercoloured background panel on Fog card base using scor tape in the middle of the panel. I wanted the edges of the panel to be raised and fold a bit. Then I adhered the sentiment die cuts on the die cut flower and leaves heart. Adhered this on vellum using foam adhesives and finally the vellum on the centre of the watercoloured background panel on the card front. No card of mine will be finished without Pretty Pink Posh sequins. And the Sparkly Clear sequins are another staple of mine on most card. Here I have used the 10mm, 6mm and 4mm sequins. 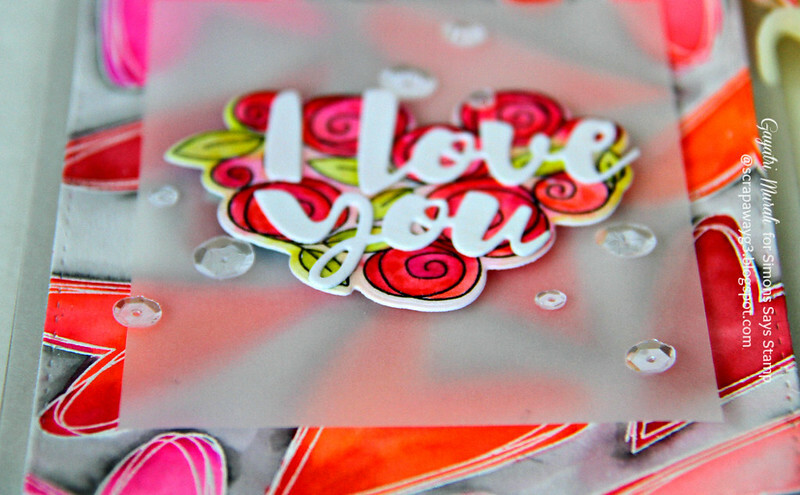 I also brushed Wink of Stella clear shimmer on all the hearts on the background and on the die cut sentiment. I really love how pretty this card turned out. 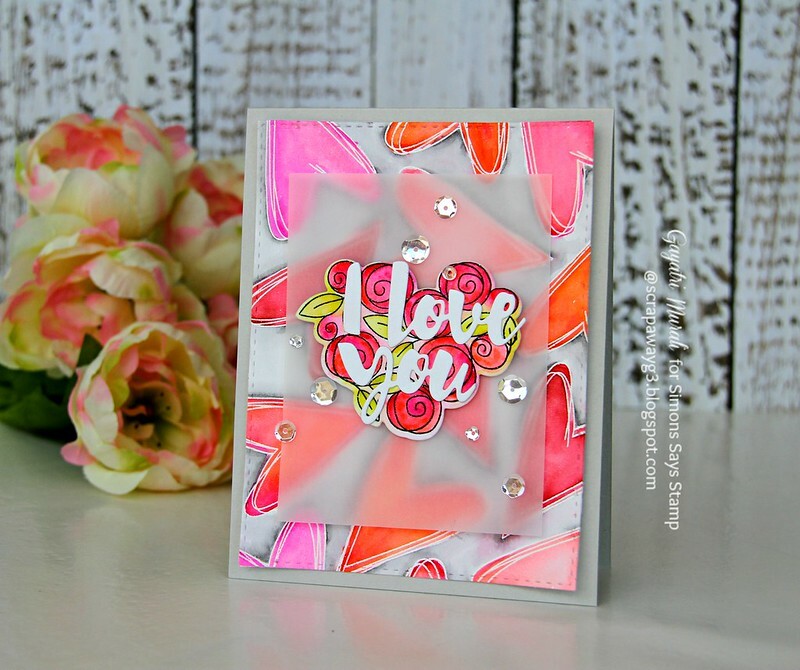 With the lots warm red and pink colours, using a light shade of grey for shadow and for the card base lightens up the entire card and gives a fresh colourful look. The white sentiment die cut now makes pops along with the sparkly clear sequins. The vellum soften the whole card. Thanks for stopping by my blog today. Have a lovely weekend! Such a bright and fun card Gayatri. 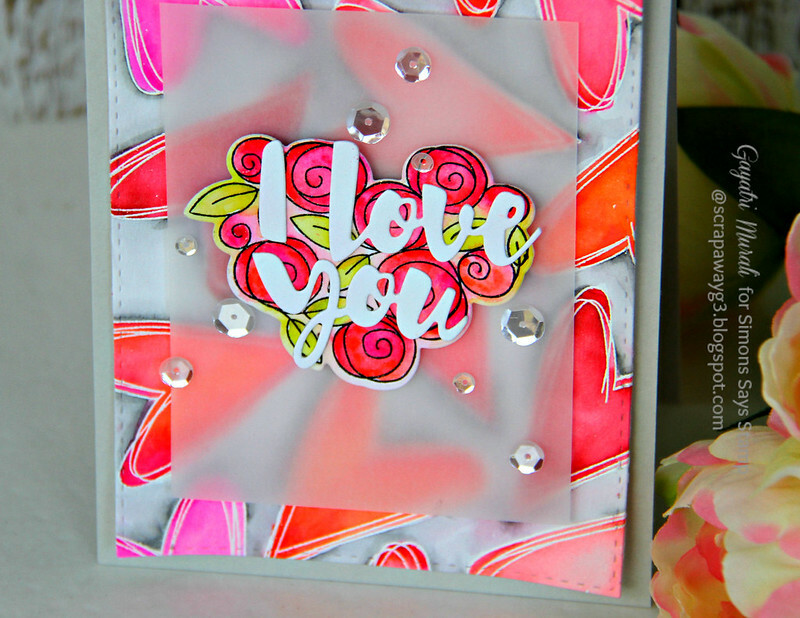 Love the heat embossed and water colored background… the blooms are so pretty. This is so BEAUTIFUL Gayatri – I love how you put all those layers on top of eo and how wonderful it turned out!